We rent big projection screens for groups up to 5.000 people 10′ x 15′ or a tripod 6′ x 6′ projection screen that is perfect for a group of 20 or 30 people. We do delivery set up and pick up, even on weekends or night hours. We have all types of projections screens from 6′ X 6′ up to a gigantic 9′ X 12′. All of them are coated with a reflective material that makes the image projected much brighter. We can install our projection screen inside of the location (for day or evening events) or outside (night only) and both options will receive an excellent picture quality. It is necessary to warn that if the equipment will be outside there should be some darkness to provide a good quality of the projection. If the projection will be outside, it should only be used for events at night. Our projector screens of 6′ X 6′ and 8′ X 8′ includes a height adjustable tripod for installation, this may be placed in the most suitable location. The 9′ X 12′ screens have adjustable legs so that the customer can place it wherever they want with the desired, most convenient height. During the last twelve years we have been part of successful events from family reunions to big events such as concerts with up to 15,000 attendees. 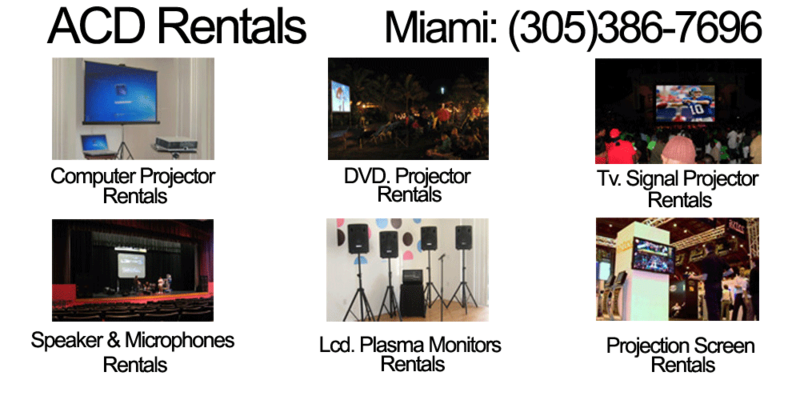 We are a local company and we can make immediate deliveries of equipment to Miami or Broward.